Beer Advocate's List of Top 50..
Up in the northwest corner of Louisiana, Shreveport and Bossier City are often-forgotten parts of the state. They are far from New Orleans and Cajun country, closer to Dallas than many of the areas Louisiana culture focuses on. Shreveport is worth another look as a travel destination — the region has flourished for nearly 200 years because of trade along the Red River and its proximity to Texas; it has its own cultural touchstones and history, and locals are more than happy to share with anyone who stops by. The city has had a significant impact on the course of country music history. Hank Williams lived and died here. Huddie “Lead Belly” Ledbetter was born in nearby Mooringsport and got his start just after the turn of the 20th century playing guitar and singing in the old red-light district in the city called St. Paul’s Bottoms. Elvis Presley made his musical debut here in 1954 as part of the weekly Louisiana Hayride musical program at the Shreveport Municipal Auditorium and performed there weekly for 18 months. Note that although Shreveport and Bossier City are two cities divided by the Red River, people look at them as twin cities — one supports the other. When you’re planning a jaunt to Shreveport, keep in mind that the city has several well-known and beloved festivals and annual events, including Crawfest and 318 Restaurant Week in March, Mudbug Madness Festival Memorial Day Weekend, the Highland Jazz & Blues Festival in September, and the Red River Revel in early October, which is the largest festival in North Louisiana — it offers a week of music, arts, and food at Festival Plaza. Shreveport-Bossier has plenty of options for lodging. Enjoy cozy, antique-filled rooms and dynamite breakfasts at Fairfield Place or 2439 Fairfield, two bed and breakfasts within a block or so of each other in one of the city’s historic districts. For a more modern experience, the newly renovated Homewood Suites by Hilton is convenient, spacious, and has a lovely pool area. There are several other chain inns and hotels along Old Minden Road, as well as several hotel options across the river in Shreveport, mostly in or around casinos. Getting away from the city might be just the thing. Mahaffey Farms in Princeton is only 15 miles from downtown Shreveport, but it’s like a whole different world. This working farm grows produce and raises pigs, cows, and chickens for meat, eggs, and dairy. Accommodations in the large, rambling, comfy farmhouse are arranged through Airbnb. In the morning, you’ll get a full, hot breakfast with the freshest ingredients imaginable. More than just a place to stay, Mahaffey Farms is a vital part of the growing local food culture in Shreveport. Its sustainable farming practices benefit the entire community when the family takes its products to local farmers’ markets or welcomes visitors to its farm stand. The setting is idyllic; the family is friendly; and the food is delicious. The Shreveport-Bossier City area is well known for casinos, including the El Dorado and Margaritaville. The area also has a variety of rich cultural resources centered around music, art, food, and festivals. The crown jewel of Shreveport’s downtown arts district is the beautifully renovated Strand Theater, the official state theater of Louisiana, listed on the National Register of Historic Places. Built in 1925, the flagship of the Saenger brothers’ 320 theaters across the South, it fell into disrepair in the postwar years and closed in the mid-1970s. However, local philanthropists and the community rallied around restoration, and the Strand reopened in 1986 in all its glamorous glory. Ray Charles played there in 1996, and live music still has a place on the schedule, with bands like The Cult, The Rides, and Old Crow Medicine Show. Touring Broadway productions such as 42nd Street, and Pippin have stopped at the Strand, and comedians David Cross, Whose Line is it Anyway? stars Colin Mochrie and Brad Sherwood, and Bill Burr have graced the Million Dollar Theater, as it was once known. With the city’s historic reputation for country music and blues, big names, including Bob Dylan, Robert Plant, Diana Ross, Marilyn Manson, the Alabama Shakes, and Modest Mouse have performed at the Municipal Memorial Auditorium, an Art Deco-style concert hall and community center built in the late 1920s. It’s also on the National Register of Historic Places, and legend has it that it was the first place where the phrase, “Elvis has left the building” was heard. The Shreveport Opera provides a variety of musical performances, from Fiddler on the Roof to La Boheme, at the Strand and Riverview Theater. Local musicians are celebrated, including Buddy Flett, slide guitarist and songwriter; rock band the Seratones; and country musician/producer Jimmy Wooten. Keep an eye out for them and other local talent to pop up at festivals, bars, and other performance spaces. The Robinson Film Center hosts a variety of classic, foreign, and current art-house films. Artspace, with three gallery spaces, is a key creative space for local artists and the community experience. Celebrated Shreveport writer, artist, and Oscar-winning filmmaker William Joyce, well known for his work creating character and film concepts with Pixar and Dreamworks Animation, producing and directing animated films, and numerous New Yorker magazine covers, curates Artspace. Joyce also co-founded Moonbot Studios, a film and visual effects studio in Shreveport. His connection to the community goes beyond his role as artistic director of Artspace — his drawings and doodles grace the walls of Cush’s grocery and market, where locals enjoying chicken salad, cheesy bread, or muffulettas in the café can take in what may amount to a half million dollars’ worth of original art. The RW Norton Art Gallery is a beautifully curated art museum with 40 acres of azaleas and other botanical gardens on its grounds. Inside, the work displayed in the permanent collection spans hundreds of years, with a particular focus on 19th- and 20th-century American and European art, most notably Frederic Remington and Charles M. Russell. The Norton grounds, permanent collection, and special exhibits are free of charge. Racehorse and bourbon fans, take note: Shreveport Derby Day festivities take place on the grounds of the Norton. There are plenty of places to shop in the area. Take a walk down the Line Avenue Shopping District for boutiques, antiques, jewelry, and other high-end gift ideas at shops like The Enchanted Garden, Village Washstand, and the Spotted Zebra. A Line Avenue antiques store of sorts, Day Old Blues Records is a must-see for visitors who love vinyl. It’s got a great selection, and if you need help, Rex is your man. The Louisiana Boardwalk is another good spot to wander and window-shop, although the stores tend to more national outlets like The Children’s Place, Fossil, The Gap, and Kay Jewelers. There’s a locally owned and operated spot on the Boardwalk perfect for candy fans, Chocolate Crocodile, which sells its homemade chocolate along with a startlingly large selection of candied apples. Shreveport can satisfy other vices as well — find locally made wine at On Cloud Wine. While it’s not a vineyard (Louisiana weather does not make that feasible), the grape juices are sourced from fertile wine regions all over the world and made in stainless steel tanks right on the premises. On Cloud Wine has 17 wines available ranging from the Southern Hurricane Pinot Grigio to Red River Ripple Tempranillo to Shay Cherie Riesling. There are also three thriving breweries in the area. Other local booze options include inventively named and garnished frozen daiquiris from Alky Therapy, a selection of 100-plus whiskeys at Fatty Arbuckle’s, and a gastropub experience with live music at Noble Savage Tavern. Chef Hardette Harris is a Shreveport native who helped create Shreveport’s official dish, and she works tirelessly to educate locals and visitors about what makes Northern Louisiana cuisine special, with her “Us Up North” initiative. She offers cooking classes and food tours, which are both well regarded and worth seeking out. The Shreveport-Bossier food experience could stretch over a long weekend of tours — there’s so much culinary history. Take the stuffed shrimp — a standard shrimp preparation in the South. 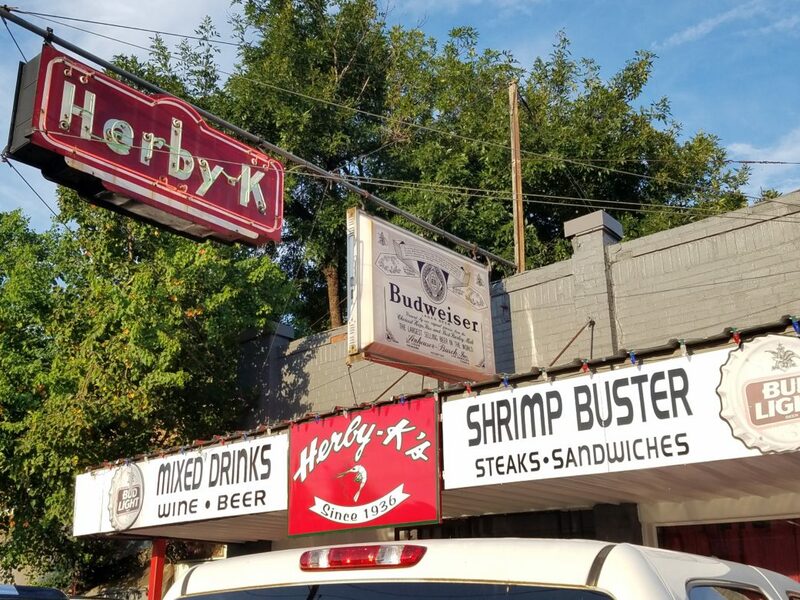 In Shreveport, it’s taken to an extreme, stuffed to the max, and then battered and fried, as found with the Shrimp Buster at Herby-K’s, and the Cajun Stuffed Shrimp at Eddie’s Seafood and Soul Food. There’s a considerable number of Mexican restaurants in the area to keep locals arguing about which taco is the best in town. It usually comes down to Ki Mexico, Taqueria La Michoacana, Parish Taceaux, and Tacomania Cantina. Ki Mexico packs fine-dining flavor intensity in every taco variation (and both its soup and flan specials are killers); Taqueria La Michoacana is more traditional with high-quality ingredients prepared authentically; Parish Taceaux has a more playful take on the taco, using ingredients like Korean BBQ skirt steak and Nashville hot chicken; and Tacomania brings a Tex-Mex/Southern California sensibility to the scene (although apparently there are more authentic specials available off-menu). Breakfast is the most important meal of the day, especially when it involves strawberry pie at Strawn’s Eat Shop. In addition to pie, Strawn’s serves enormous, flaky, warm-from-the-oven biscuits with sausage gravy, as well as omelets barely contained by the platter-sized plates they’re served on. It’s a diner experience dating back to 1944, and it’s so popular that there are now three locations. The original on East Kings Highway is the one to seek out for old-fashioned charm. Make sure to see the Pie Lady in action. If a boozy brunch is preferred, Chef Robert “Bozz” Baucum offers an all-you-can-drink brunch service with tons of favorites, including shrimp and grits, boudin and biscuits, and beignets. The brunch is only on Sunday (and only brunch is served on Sunday), but Chef Bozz serves breakfast, lunch, and dinner the rest of the week. Shreveport-Bossier City’s proximity to the Dallas area gives its BBQ scene a Texas kick; there are plenty of smokers slow cooking meat in the area. One of the best is local favorite Real BBQ and More. Not only are the ribs and super tender “toothless” brisket delicious, but Real BBQ offers a few items you don’t see often, such as sausage made with brisket and BBQ-laden baked potatoes that end up being about three pounds once fully loaded. Owner and pitmaster Harvey Clay is a large presence in the small roadside joint, and he’s as friendly to every customer as if he’s an old, dear friend. A unique experience in the Shreveport-Bossier City area is the Chinese restaurant Lucky Palace. Attached to a rather seedy-looking motel that also houses a biker bar, adventurous types who shrug off this external ambiance will be richly rewarded inside. Be sure to try the duck on scallion pancake appetizer and one of the house specialties — tempura fried lobster tail with green curry, alligator with garlic sauce, or tamarind-marinated rack of lamb with jalapeño-mint glaze. The usual Chinese restaurant suspects are available as well. Besides its outstanding menu and the puzzling dichotomy of the location, what really sets Lucky Palace apart is its world-class wine list, which is one of the best in Louisiana, if not the entire South. Lauded by Wine Spectator and Wine Enthusiast for multiple years, owner Kuan Lim’s cellar includes treasures like vintage Tattinger, Billecart-Salmon Brut Rose Champagne, Domaine Pavelot SavignyLes-Beaune Premier Cru Burgundy, Gilbert Picq et Ses Fils Chablis, and Seasmoke Ten Pinot Noir. Shreveport-Bossier City’s cultural history has sustained them through challenging economic times that affected many mid-sized cities in the 1960s and ’70s. Their growing renaissance can be attributed to the passionate population, which loves to celebrate the region and its heritage. In addition to the cuisine, art, and music found in Northwest Louisiana, the Shreveport-Bossier City area supports three breweries that not only provide fresh, delicious, locally made beer to the Shreveport market and beyond, but also have created community spaces, fundraising opportunities, and economic stimulation. To the locals and for tourism, they’re an integral part of the region. Red River Brewing opened in 2013 and began brewing on a tiny system in a rented storage space, only able to provide the immediate area with kegs of its flagship beers. In 2016, the company expanded to a new facility at 1200 Marshall Street, downtown, creating an enormous taproom, event space, and more space to brew. Owners and founders Jared Beville, Robert McGuire, and Beau Raines quadrupled the brewery’s capacity with the expansion, going from a five-barrel to a 20-barrel brew house in 17,000 square feet of brewing space. The public taproom is 4,000 square feet and has games, picnic tables, and a bar serving up 10 freshly brewed beers. Chris Jay, the public relations manager for the Shreveport-Bossier Convention and Tourist Bureau, says that whenever he’s at the Great Raft tap room over the weekend, cars with Texas license plates and other out-of-town visitors fill the parking lot with trunks straining under the weight of cases of beer to take home. “It’s such a trip to see that a Shreveport product has struck such a chord in the wider beer community,” Jay says. Owners and founders Andrew and Lindsay Nations, high school sweethearts and Shreveport natives, had relocated to the Washington, DC area and fell in love with craft beer and the culture supporting it. Shreveport had nothing like it, so they moved home, opened the brewery after several years of hard work and planning, and reached out to the local consumers, the majority of whom didn’t have any exposure to the flavors, styles, and price points of craft beer. The newest player on the field is much smaller in terms of operations. Flying Heart Brewing is in a historic former firehouse on the other side of the Red River in Bossier City. The owners and co-founders are two married couples, Ben and Leah Hart, and Ben and Elizabeth Pattillo, who used to brew together before deciding to try it professionally. The cozy taproom space pays tribute to the firefighters who previously used the space and to Ben Hart’s family, whose ranch in Washington state has the same name, and the family cattle brand is the brewery’s logo. Flying Heart sits on the mile-long stretch of Barksdale Boulevard that’s being transformed into the New Downtown Bossier City project, slated for completion by summer. Once finished, the brewery will be in the middle of new retail and event spaces. Hart says he’s confident that the pedestrian- and bike-friendly area will be worth the disruption the construction has caused, and he is looking forward to being a part of the revitalized area. Outside the brewery taprooms, the best place to get Shreveport-Bossier beer is from restaurants that eagerly serve up what’s fresh and local. Ki Mexico owner Rodrigo Mondragon has supported Great Raft Brewing since he was selling his tacos at the brewery from his food truck. All taps carry Great Raft’s beers, so the whole lineup is available. Twisted Root Burger Bar, a regional chain based in Texas, has two locations in the area, one in Shreveport and one in Bossier City. Owner Grant Nuckolls says the number of tap handles in the Shreveport restaurant has practically doubled from 16 to 28 in the three and a half years that Great Raft and Red River have been open. Brewniverse is an important part of the local craft beer scene as well. It’s been around for five years and serves as the area’s best bottle shop, homebrew supply store, and hub for events such as special cask tappings, new beer releases, and homebrew competitions. “It’s fun to tell local stories through our beer to all the travelers who pass through,” Red River’s Jared Beville says. Beer is about so much more than the beverage itself. It’s about sharing a moment with a friend or stranger, conversation, laughter, and being part of a community. In Shreveport and Bossier City, these three breweries are the perfect places to relax and enjoy not just beer, but life.